The Communist Party boss of Urumqi said the government will seek the death penalty for anyone found to be behind the deaths of 156 people killed in riots in the capital of Xinjiang. Li Zhi told a news conference Wednesday that Urumqi was stable after several days of ethnic violence. He said security forces had control of the streets. China flooded the capital of western Xinjiang province with security forces, and President Hu Jintao cut short a visit to the G8 summit as Beijing tries to stem a tide of ethnic clashes. Zhi said many people accused of murder had already been detained and that most of them were students. Helicopters dropped leaflets appealing for calm among Urumqi's 2.3 million residents, although the official Xinhua News Agency said there were "sporadic standoffs" between protesters and security forces, and some minor clashes. It did not give details. Hu arrived home Wednesday "due to the situation" in Xinjiang, Xinhua said. It did not say what action he would take. In some areas of the city, residents formed alleyway barricades with furniture and debris to stop a repeat of the fighting between minority Uighurs (pronounced WEE-gers) and Han Chinese - the country's majority ethnic group. "The government told us today not to get involved in any kind of violence. They've been broadcasting this on the radio, and they even drove through neighborhoods with speakers telling people not to carry weapons," said one Han Chinese man who would give only his surname, Wang. Hundreds of paramilitary police guarded the main roads to Uighur neighborhoods and the central square in Urumqi (pronounced uh-ROOM-chee), where the first riots began. Most were armed with shields and clubs, while a few had assault rifles fixed with bayonets. It was not known if any new arrests were made. The government has already said more than 1,000 had been detained. The notes dropped by helicopter carried an appeal for calm from Xinjiang's Communist Party secretary. "Secretary Wang urges everybody to return home, return to their work units and return to their communities," read the title in bold Chinese characters. Crowds reacted warily. "We don't believe this. They need to tell the Han to retreat. We're going to stay here to protect our homes," said a Uighur businessman, who would give only part of his name, Mamet. Shortly afterward, policemen - some Han, some Uighur and armed with handguns and automatic rifles - came through the neighborhood to enforce calm. "We are just protecting our homes. 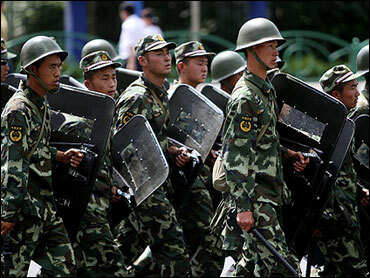 We are not planning a counterattack," said one of a group of 10 Uighur men guarding the entrance to a side street. After talking with the police, the men turned and walked inside nearby shops and buildings. Uighurs say the riots that started Sunday - put down by volleys of tear gas and a massive show of force - were triggered by the June 25 deaths of Uighur factory workers during a brawl in the southern Chinese city of Shaoguan. State-run media have said two workers died, but many Uighurs believe more were killed and said the incident was an example of how little the government cared about them. Many of the Turkic-speaking group believe the Han Chinese, who have flooded into the rugged, rapidly developing western region in recent years, are trying to crowd them out. The Han Chinese say the Uighurs are backward and ungrateful for all the economic development and modernization. They also say the Uighurs' religion - a moderate form of Sunni Islam - keeps them from blending into Chinese society, which is officially communist and largely secular. The authorities have been trying to control the unrest by blocking the Internet, including social networking sites such as Facebook, and limiting access to texting services on cell phones. At the same time, police have generally been allowing foreign media to cover the tensions. On Wednesday, workers in Internet cafes in two other Xinjiang cities, Turpan and Kashgar, said Internet connections had been cut. "The police came to us and told us to shut down our Internet cafe for the next three days, but who knows how long this will last," said the manger of the Huo Zhou Internet cafe in Turpan. He would give only his surname, Pei. An operator with China Mobile's service center in Xinjiang, who refused to give her name, said all the services for cell phones, except making and receiving calls, had been suspended, including sending and receiving text messages - one of the major ways Twitter messages are distributed. She said many calls were not going through because the system was overloaded.